Jet packs, giant robots and George Clooney – what more could you want from your blockbuster? Brad Bird does old-fashioned sci-fi the new-fangled way and makes the future fun again. So is it all about Disneyland? Is Uncle Walt in it? Does it have anything to do with that weird box of clues on Twitter? Do we find out why George Clooney has an exploding bathtub? Err... in response to all the above, yes and no. The fact that you leave Tomorrowland: A World Beyond with more questions than answers is sort of the whole point. None of which takes away from the gleeful, heartfelt, old-fashioned spirit of adventure that keeps your head spinning in a good way. Following up his live-action debut Mission: Impossible – Ghost Protocol, Pixar veteran Brad Bird's sci-fi opus buzzes with fresh ideas. We pick the film's first story strand at the 1964 World's Fair. Budding inventor Frank Walker (Thomas Robinson) meets a creepy girl (Raffey Cassidy) and follows her into Disney’s terminally annoying slow boat ride, It’s A Small World, triggering a secret passage and popping up in a dazzling future metropolis. Skip to story strand number two and troubled teenager Casey (Britt Robertson) meets the same creepy girl, this time hopping back to the future via a magic badge. By the time strand one meets strand two (around the time we meet Clooney and his exploding bathtub), we’re already knee-deep in jet packs, alternate time dimensions and audio-animatronic terminator kids – not to mention story strands. Part Jules Verne, part Apple Store, Bird’s vision of the future is everything you hoped you’d live long enough to see when you were a kid. Set to Michael Giacchino’s rollocking matinee score, it’s an Emerald City for the retro-digital age: glass towers push through white clouds, rollercoaster rocket ships pick up the morning commute, giant robots build loop the loop monorails and swimmers dive through pools of water suspended above the street. This Bird's-eye-view teeters on sensory overkill, but is so well-intentioned – and so much fun – that you want to watch again just to savour all the background details. 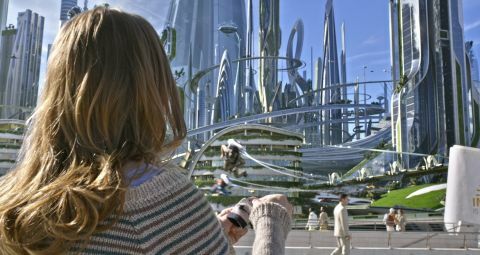 After the summer flops of the much-hyped John Carter and The Lone Ranger, Tomorrowland is a big gamble for Disney. So all credit to the Mouse House for letting Bird throw his ideas at the screen like socks at a bedroom wall. If one sticks, throw another. If it doesn’t stick, throw another anyway. In truth though, they couldn’t have found a better man for the job. Taking the warm ’60s nostalgia of The Iron Giant, the quick-fire pace and ’toon energy of The Incredibles and the elaborate yet taut action of Ghost Protocol, Bird blends everything into a thoroughly modern slice of vintage Disney. Clooney makes a great grizzled tour guide, and Hugh Laurie’s on form as the token dastardly Brit, but it’s Robertson (fresh from TV’s Under The Dome and dropping a fair few years to play a teenager) who really holds things together with spirit and smarts way beyond the plot knots. She's at her best when she’s out of her depth; the film spikes with a series of set pieces that throw her headfirst into ridiculous survival situations. A shoot-out in a comic-book store (featuring a 12-year-old attacking Kathryn Hahn with R2-D2) builds to a Looney Tunes home invasion and ends with a titanic wormhole battle that eclipses everything else in the film, even if it doesn’t make much sense. True, Tomorrowland does occasionally bog down in its own mad science; requiring a slightly higher knowledge of Tachyonic Field Technology than most average eight-year-olds possess, the last act feels more like Interstellar than Escape To Witch Mountain. Then again, as a grumpy Walker says to Casey around the mid-point, “Why do you have to keep asking so many questions? Can't you just... Be amazed?" Indeed, if you’re willing to let a few things slide, this is one of the best family blockbusters in years. Clooney and Robertson (literally) soar, the madcap action always feels grounded and Bird’s world is bursting with visual invention. More importantly, it’s a wholly original sci-fi that manages to be both savvy and deeply uncynical, offering a bright, white alternative to the dusty, rusty dystopias that plague multiplex screens every summer. Attempting to bring optimism back into style, making a strong argument against the kind of future we usually offer our kids, suggesting that we’re never going to live like The Jetsons unless we really want to... Tomorrowland has plenty of moral messages to offer, but they're not the kind that stick in the teeth. So is it really just a kids film dressed up as retro adult sci-fi? Is it the other way around? Is it all really about Disneyland? Just shut up and be amazed.